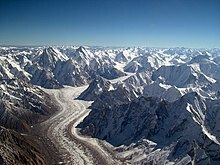 The Baltoro Glacier in the Karakoram, Baltistan, Northren Pakistan. At 62 kilometres (39 mi) in length, it is ane o the langest alpine glaciers on yird. A glacier is a persistent body o dense ice that is constantly movin unner its ain wicht; it forms whaur the accumulation o snaw exceeds its ablation (melting an sublimation) ower many years, eften centuries. This page wis last eeditit on 19 August 2017, at 05:28.